At the City Council Mtg., on October 31st, Alderman Ricardo Muñoz (22nd Ward) introduced a budget amendment to move $25 Million to fund mental health services in Chicago. 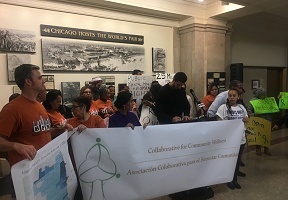 On Monday the Collaborative for Community Wellness, a coalition of community groups and health providers, testified at the City Council Budget Committee mtg. 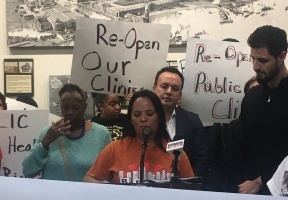 in favor of the amendment, which would include funding to re-open and staff the city-run mental health clinics that Mayor Rahm Emanuel closed early in his tenure. Additionally, these funds would go to dramatically expand the long-term trauma-focused and free mental health services provided by non-profit organizations, hospitals, and clinics in the areas not served by the city-run mental health clinics. 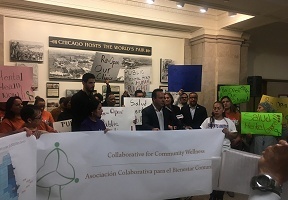 Community Leaders from the Collaborative for Community Wellness, a coalition of community organization and health service agencies, including: Saint Anthony Hospital, Brighton Park Neighborhood Council (BPNC), Erie Neighborhood House, Southwest Organizing Project, Peace and Education Coalition, Pilsen Alliance, Universidad Popular, Padres Angeles, Southside Together Organizing for Power and Taller de Jose attended the press conference.